While waiting for our GeForce GTS 250 to turn up, the graphics test rig was standing idle, and BFG rang to say it had a water-cooled GTX 285 card if we wanted to test it. In fact, the card being offered was the only one in the world and seeing as we didn’t have any other cards to test, we gave it a whirl. 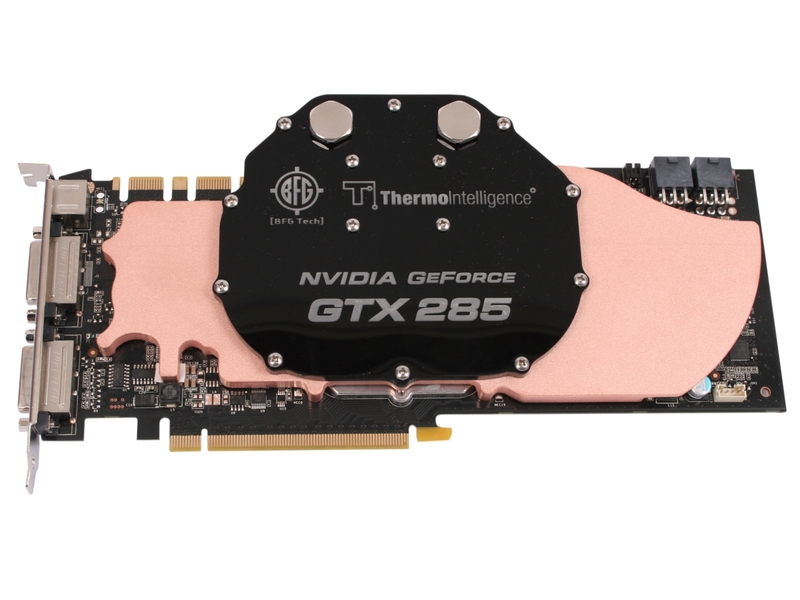 Our first look at the GTX 285 concluded that despite the card being the fastest single-GPU card around, it needed to be cheaper or faster (preferably both) to compete with either of ATI’s X2 cards. Were you to find a GTX 285 at Radeon HD 4850 X2 prices, you’d probably opt for the Nvidia card, but it needs to be faster to take on the HD 4870 X2. The BFG card in our last GeForce GTX 285 review was a super-overclocked OCX model with already massively increased clock speeds. 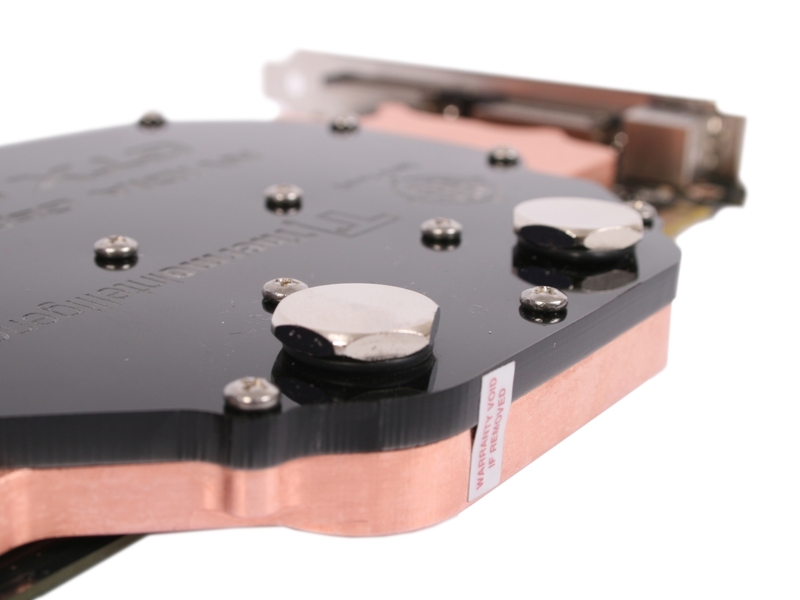 Given that this card wasn’t a match for the HD 4870 X2, and that it’s impossible to shift the price of a GTX 285 card down and still make money until Nvidia cuts its GPU price, BFG has tried a third alternative to make the GTX 285 make sense: water-cooling. 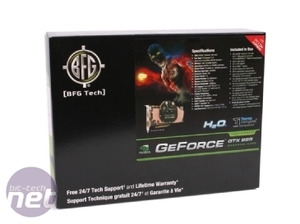 The BFG GeForce GTX 285 H2O forgoes the boring air cooler in favour of a Danger Den DD-GTX285. The block is large enough to contact the 1GB of DDR3 memory on the card (remember, the GTX 285 has all of its memory on the GPU side of the PCB, unlike the GTX 260 and GTX 280). It also covers the VRMs and I/O chip. Danger Den has added some welcome new features with the block too, including PCB contact pads (in addition to the GPU and memory contacts). This is to prevent the PCB from warping. 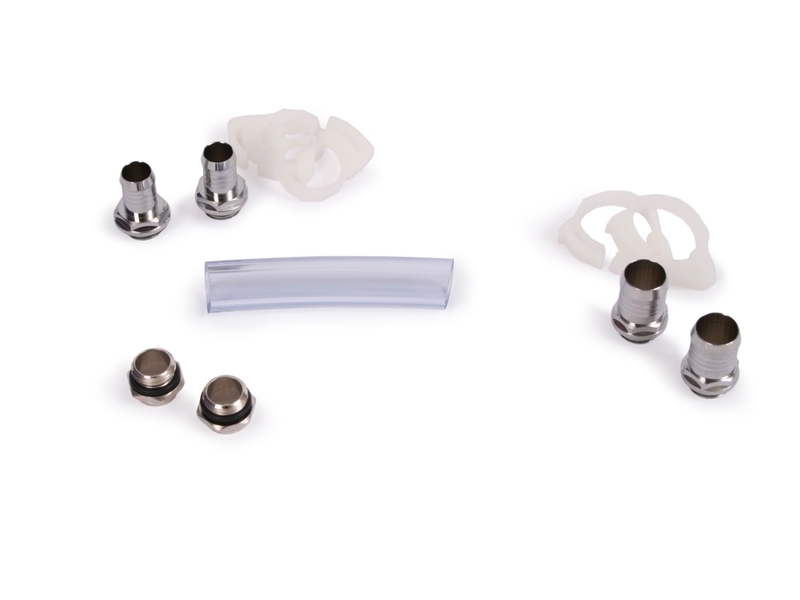 The block looks good and comes with a range of Fat Boy High Flow barbs for 1/4-1/2in, 3/8in, or 1/4in outer diameter tubing. Fitting the barbs to the block is simple – just screw in which ever ones best suit your setup and tighten them with a pair of pliers. 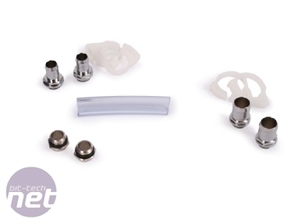 Then slip the supplied tube clamps (or your own preferred clamps) onto the loose ends of tubing, shove the tubing onto the barbs and then clamp the tubing down. Just make sure that you actually clamp the tubing – if the clamps slip down the barb too far they’ll just clamp to the bezel of the barb and won’t hold the tubing on. 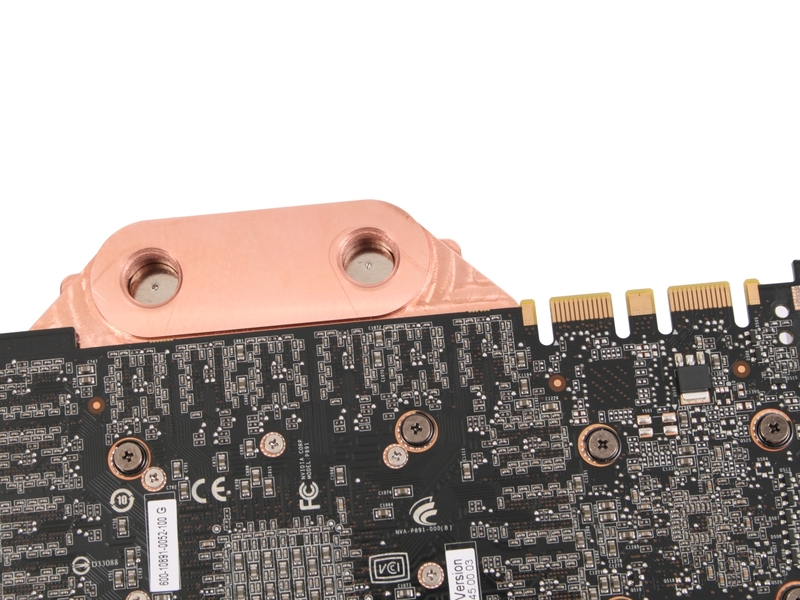 Despite the waterblock, BFG hasn't clocked this card to the levels of the OCX. Its core is clocked at 666MHz, which is some way off the 702MHz of the OCX and only 18MHz higher than the reference frequency. While the OCX stream processors run at 1,584MHz, the H2O’s stream processors only run at 1,512MHz, a trifling 36MHz faster than a reference card. The memory of the H2O runs at the standard 2,484MHz (effective) while the OCX at least ups this frequency to 2,664MHz (effective). We wonder why BFG has bothered to overclock the card at all really as the performance increase from these minor overclocks is likely to be minor at best. 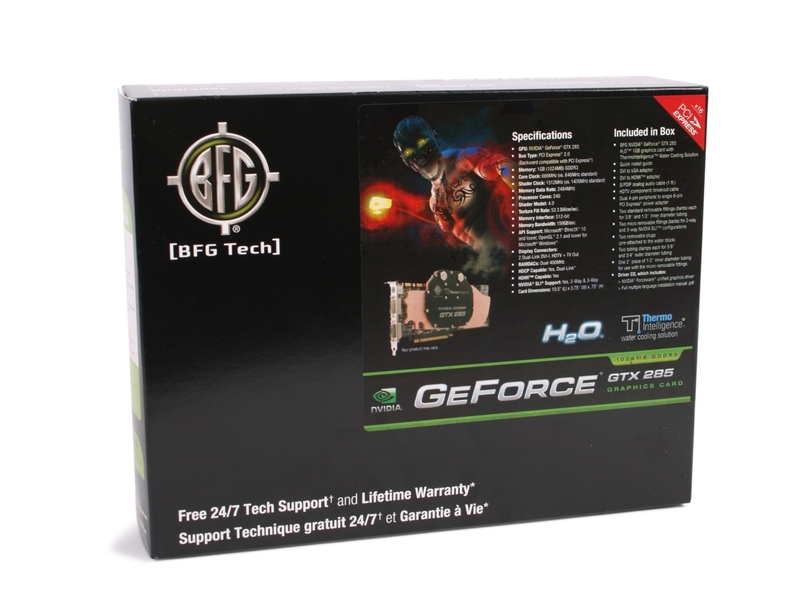 Further, the addition of a waterblock has given to rise to the $499.99 price, while BFG’s GTX 285 OCX is currently selling for £351.89 inc VAT and the cheapest GTX 285 is a more reasonable £284.99 inc VAT. Let’s hope the waterblock is awesome at cooling. 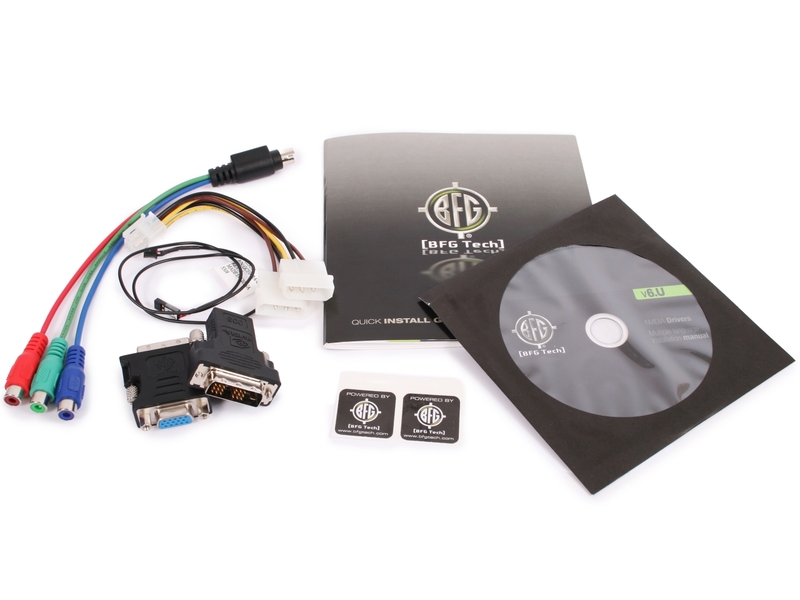 BFG Tech offers a ten year warranty on its products in Europe (because of EU legislation) and a lifetime warranty across the Atlantic in the USA and Canada. The warranty needs to be activated directly with BFG within 30 days of purchase in order to get the full term, otherwise you'll just be limited to a statutory one year warranty. That's fair enough, but it's something you need to be aware of. In addition, BFG also offers its customers free 24/7 technical support via a free 1-800 number, (it's a USA number, you'll need to use SkypeOut to call it free of charge from elsewhere), or via email. The RMA process itself is all handled by UK/USA based RMA centres, so you won't have to pay for a FedEx courier to the States should you have problems with your card. BFG Tech also has a 100 day trade up programme, but it's only available in the United States at the moment. BFG is aiming to roll this out in Europe with the launch of its Phobos PC ‘in the next few months’. The hold up is purely logistical, but it seems that BFG are finally getting on top of this problem. Inno3D has some images of its upcoming watercooled Black Freezer graphics cards, which will include Nvidia's GTX 470 and GTX 480. If a stock GTX 285 just isn't enough then Asus has released an ROG graphics card. Standing next to motherboards such as the Maximus, Rampage and Crosshair, the Matrix GTX285 promisses enhanced overclocking and has duely been put through its paces in our lab.